Aston Martin DBS Superleggera Performance, Engine, Ride, Handling | What Car? You may recognise the DBS’s basic form, because although Aston Martin counts this as a bespoke model, the DBS is more derivative than disparate from the company’s latest grand tourer (GT), the DB11. There are more than just a few tweaks to justify the price hike, though. For a start, it has a wider stance, which improves stability and gives greater road presence. Then there are the aerodynamic accoutrements, such as a larger rear diffuser, which together deliver 180kg of downforce at the car’s top speed of 211mph. The DBS is lighter than the DB11, too. Why? Well, instead of the DB11’s aluminium bodywork, it uses mostly lighter carbonfibre cladding to improve everything from its handling to its performance. Speaking of which, the 5.2-litre twin-turbocharged V12 petrol engine is also from the DB11, but with the wick turned up to eleventy. It now produces a scarcely believable 715bhp, which, perhaps even more unbelievably, is still some way down on the Ferrari 812 Superfast’s 789bhp. Nevertheless, it's a substantial amount, and it's channelled through a rear-mounted, eight-speed automatic gearbox, which has been beefed up to handle the mutinous 664 lb ft of torque, to the rear wheels only, through a limited-slip differential. Now, if you’ve ever driven the DB11, you’re probably thinking that the last thing it needed was more grunt; it can be a little skittish, you see. Yet Aston Martin has set out to make the DBS ultra-useable and driveable, despite its incongruous power. Part of that process involved fitting it with a set of specially developed Pirelli P Zero tyres. What’s it like? In a world where a Tesla’s inaudible speed is very much the talk of the town, there remains something utterly wonderful about being able to thumb a starting button and listen to the uniquely uniform whirr of a V12 cranking over, before those twelve cylinders awake and rattle off their salvo of delicious noise. Arguably, this isn’t the most evocative-sounding V12 of all time, but in the same way that to some Ossetra caviar might not be considered quite as scrumptious as Beluga, if you catch our drift? At idle it hums sweetly, and through the rest of its rev range the continual changes in tone keep you fascinated. Its range is baritone to tenor, underlined mostly with that soft persuasiveness associated uniquely with V12s. This is interspersed with occasional tangents of hardnosed, mechanical thrash metal that give this engine its aural signature. So, the noise is edifying, but what can we say about its performance? Oddly, you almost expect a bit more savagery in first gear, because, after a momentary pause for the twin turbochargers to add their version of Scotch Bonnet chilli sauce into the performance broth, it builds excitedly but by no means explosively to its 7000rpm crescendo. Then you repeat the same foot-flat antics in second or third, and suddenly that monstrous torque is like the enormous gloved hand of a six-foot-plus goalkeeper thumping you in the chest. And watching the numbers building rampantly on the digital speedometer confirms what your senses are telling you: oh yes, this is a truly fast car. It wholly justifies Aston Martin’s claims of 0-100mph in 6.4sec, or 50-100mph, in fourth gear, in just over 4.0sec. Yet it’s not like a rampant Catherine Wheel that’s about to come loose at the nail; it’s epic but manageable, unlike the 812 Superfast’s explosive motor. That performance does seem to show up the gearbox’s failings, though. 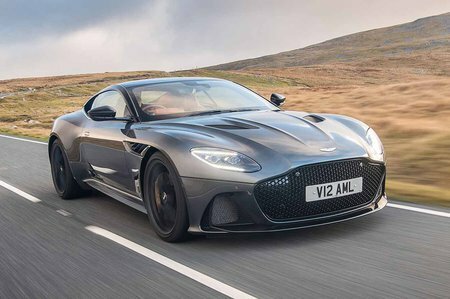 It’s a regular automatic, rather than an 812 Superfast’s quicker-shifting dual-clutch ‘box, and its changes are decidedly slurred and less reactive to your pulls on the change paddles behind the steering wheel. It’s a weakness, certainly, but not a deal-breaker. Again, that description of usability shines through elsewhere. The DBS, despite its prodigious power, conjures up otherworldly traction from its rear tyres. So much so that you can trust it like a rear-engined Porsche 911 out of corners. Instead of the traction control button taunting you like some form of kamikaze dive-bomb mode, you can switch it off and play. Yes, we did say that; if the conditions are right, you can play with this car and all its power. You can revel in its almost maternal nature in a way that you simply cannot with other front-engined, rear-wheel-drive cars, the 812 Superfast included. It looks after you in other ways, too. The delicious steering weight and accuracy that allow you to guide the DBS using just your fingertips; the inherent balance and poise of its chassis; the well-metered brake pedal and vast carbon-ceramic brake discs that haul you up assuredly. This big GT puts you at the epicentre of the driving experience, and with that comes a feeling of full control. On the subject of its GT credentials, if you’re thinking that all this handling prowess comes at the expense of ride quality, you’d be wrong. 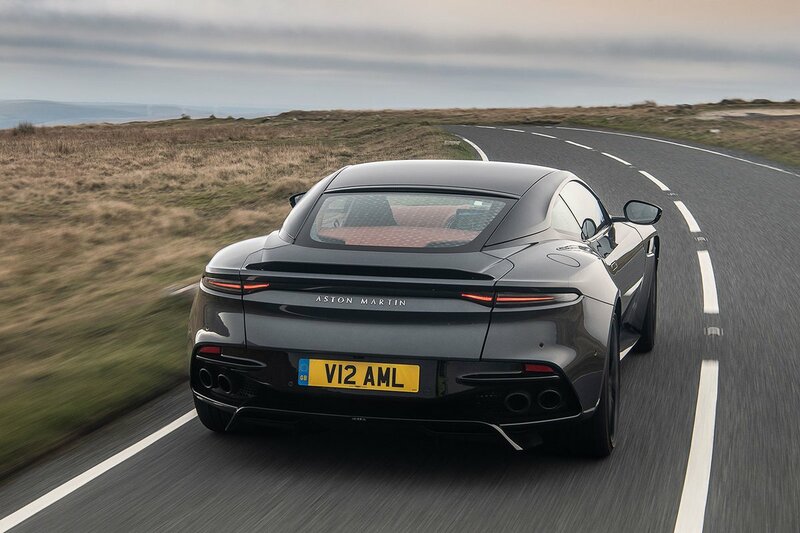 There isn’t a vast amount of wheel travel available, but the springs and adjustable dampers act as one to maintain contact with the road - even if it's a decidedly uneven one - while still letting the DBS almost float along without ever jarring or thumping. For the best compromise of ride and handling, you can even pop the dampers into their midway Sport setting without you or the car becoming unsettled.